Kidney stones result when urine becomes too concentrated and substances in the urine crystalize to form stones. Symptoms arise when the stones begin to move down the ureter causing intense pain. 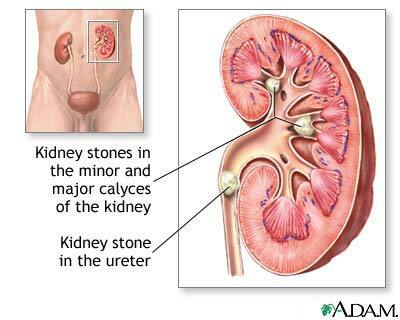 Kidney stones may form in the pelvis or calyces of the kidney or in the ureter. Reviewed By: J. Gordon Lambert, MD, Associate Medical Director; G. Eric Morgan, MS3; RxRemedy and A.D.A.M. Medical Illustration Team.